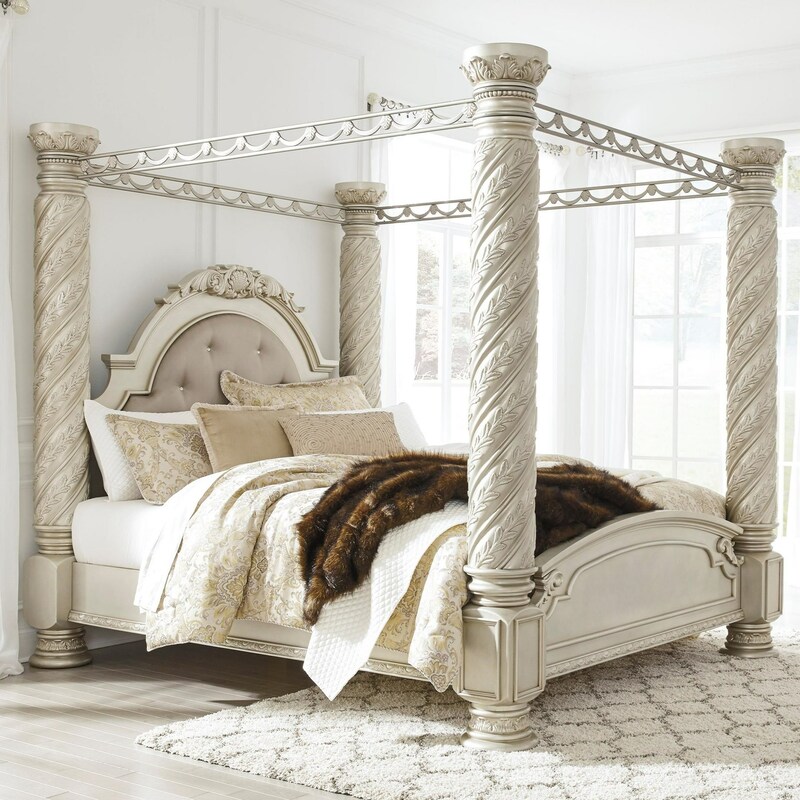 Ornate detailing on the large scale posts and crest on the headboard of this poster canopy bed offer traditional style with a glam update. Further details include an upholstered headboard panel with faux crystal button tufting, a silver finish with light glaze, and the metal canopy. The Cassimore Traditional King Poster Canopy Bed with Large Posts by Signature Design by Ashley at Miskelly Furniture in the Jackson, Pearl, Madison, Ridgeland, Flowood Mississippi area. Product availability may vary. Contact us for the most current availability on this product. Drawer / Shelf Construction Dovetail drawer construction. Clear sealed sides. The Cassimore collection is a great option if you are looking for Glam Traditional furniture in the Jackson, Pearl, Madison, Ridgeland, Flowood Mississippi area. Browse other items in the Cassimore collection from Miskelly Furniture in the Jackson, Pearl, Madison, Ridgeland, Flowood Mississippi area.